Due to the huge number of different gas mixtures that CK Special Gases can offer it is impossible to detail a list of our specific product offering. We are able to produce the most complicated gas mixtures, with components specified down to PPB (parts per billion) levels. This is not an exhaustive list and we would therefore suggest that you contact us to discuss your specific requirements. We are pleased to offer our products in a range of cylinder sizes ranging from 0.5L to 50L – but we are also flexible if you need lower quantities. 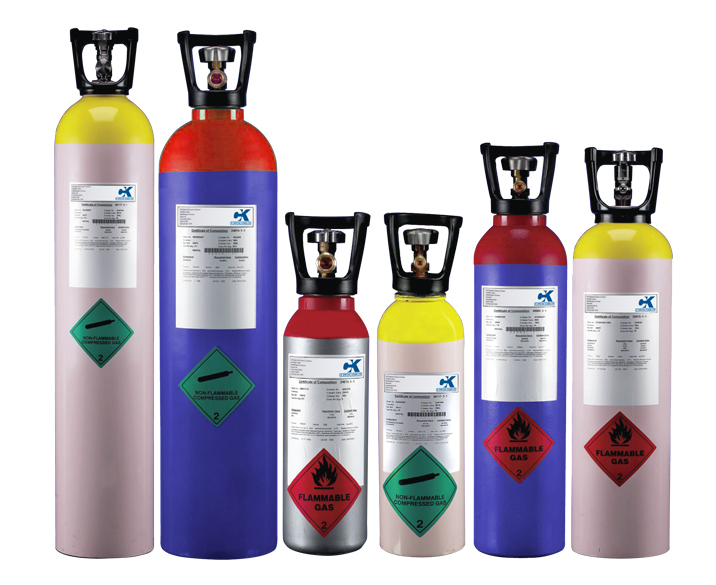 All of our gases are supplied with the appropriate cylinder fitting for the gases you specify. We are also able to offer regulators and gas supply equipment specifically to maximise the benefits of your low level mixtures – ensuring minimum / no leakage of low level contents into the regulator bodies or associated pipework. Please ask for details of our CONCOA range of regulators.